Yeast has long inhabited the planet Earth, a simple organism that is hundreds of millions of years old. It plays a vital role in the creation of alcohol as the fungus turns sugars into the intoxicating brew of choice. Without yeast there would be no beer, wine, vodka, champagne, what have you. This ancient fungus lives in the world all around us and we need only create an environment that it likes, to take advantage of it. Most people buy yeast in its dried form from the supermarket. This is because it’s the fastest method for getting your hands on usable yeast. Its dried and activates in minutes. While home brewing has become very popular, with the advent of craft breweries, yeast is used mostly for raising bread and baked goods. Pizza crust is another popular use for it. When you have traditionally baked bread, you are tasting the regional flavor of the combined yeast and water of the area. These are all important parts of using it. It adds things. So how does it make bread rise? Well, as it consumes the sugars and breaks them down the yeast releases gas. Yes. Little bubbles of gas – mostly carbon dioxide – are what make bread and pizza rise. Without those little guys we would all be eating flatbreads morning noon and night. Making yeast with a potato is so simple it’s ridiculous. There is no reason why you wouldn’t have it on hand at all times if you have potatoes. You are merely getting out of the way of a natural process. #1. Wash your potato off and slice it in half. You can peel it if you want but you can scoop the meat from the potatoes away from the skin pretty easily when its finished cooking. #2. Place your potato into a small saucepot and cover it with water. Then bring that water to a boil. #3. Cook the potato until a fork is inserted in the center and can be pulled out without resistance. The easier to mash the better. #4. Pull the water from the heat and remove the potato. Keep the water. Its now full of starch that yeast love to eat. #5. Let the potato cool a bit and then mash it well with a fork. #6. Add the potato to a 1 quart mason jar. Then fill it up with the potato cooking water. #7. Add a ¼ cup of sugar and a tsp of salt to the mix in the jar. #8. Cover with cheesecloth and place it in a dark warm place so the yeast can get started blooming. #9. After about 2 days you are going to see the yeast bubbling into the jar ad then you will know it is in there and its ready. If you want to get the most out of your homemade yeast and bake the best bread possible you are going to use it create what is called a biga or a sponge. This is when you take a portion of your flour and yeast from a bread recipe and allow it to mingle for a day or so before making the bread. You mix up a batter consistency of these two ingredients, cover it, and keep this mix in a cool dark place. If your recipe calls for 4 cups of flour and tbsp of yeast you will want to mix about 2 cups of flour 1 tbsp of yeast and enough water to make a thick batter consistency. This will ferment and create a depth in flavor that you wont get otherwise. You can also use a portion of your biga and sustain the rest by feeding the active yeast each day. Your sponge is literally a living, breathing entity that can be fed flour and sugar each day. It will gobble this up and all it will require is that you add these ingredients and maybe some warm water from time to time. All of this sustainable leaving and flavor from a single potato. A lot of articles tell you how to make yeast from various items but never really go into detail on how to use it. If you want to turn yours into a one time use just substitute 1 tablespoon of your fresh yeast for 2 tablespoons of a packaged one. Use the amount of water that the recipe calls for and don’t deviate from that. The rest of it from your jar will eventually die and you can start over. This yeast can be used just like store bought one in any application. However, the best method for sustaining your yeast is to use the sponge method and keep that thing alive as long as you can. If you get proficient at this then you will have it on demand all the time and never need to buy the packets. There are other things that you can use to make yeast. You have to remember that it is everywhere and all you have to do is create an environment that this little fungus loves. Crushed fruit that is covered and left out for a couple days will begin to bubble. In this situation you have yeast that is eating the sugars in the fruit. Traditional San Francisco sourdough actually gets its unique flavor from lactobacillli that produce lactic acid during the fermentation process, but there’s yeast in there too. To make a sourdough starter just mix flour and water into a stiff dough, and leave it exposed to the air for a few days until it starts to turn gray. Keep feeding it with flour and water every couple of days. When you want to make bread, mix the dough then add in a quarter as much starter as you have dough. 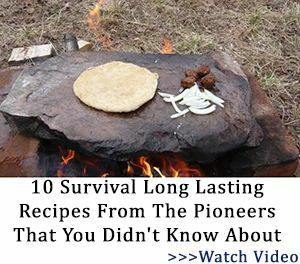 I have read articles about people using the water that potatoes were boiled in to make yeast. So, instead of using our mashed potato you would eat that potato or feed those potatoes to your family and keep the water. Store that water in a mason jar with the same salt and sugar combo. The claim is that this will go to work just the same. We have been harvesting yeast from the air much longer than we have been buying it in packets from the supermarket. It can be used in baking breads and things, but it is also a great way to produce your own alcohol. 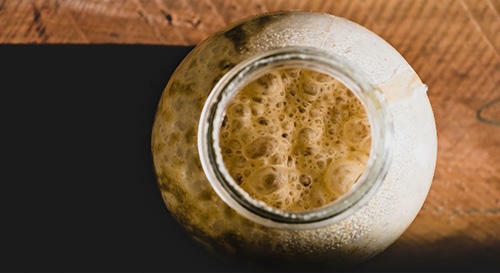 This is a great skill that uses naturally occurring yeast. Alcohol is one of the most powerful preps for cleaning wounds or bartering. For daily use, however, you will use it to make bread. Making quality dough is a skill that preppers don’t spend enough time on. When you start to understand making dough you can apply that to a number of things. It’s a no brainer for preppers to store things like grains and whole red wheat. Why is it not as much a priority to master the creation of doughs with that wheat? Pluck some yeast from the air and start playing around with breadmaking. It’s a legitimate prepping skill that deserves your time. You might fall in love with it, so be careful. So, this recipe makes me nervous because potatoes are also known for botulism. Botulism is mostly a hazard in badly canned food. It’s an anaerobic bacteria, and grows in a low-oxygen environment. It’s also been associated with baked potatoes (very rarely) because a potato’s skin is airtight. The risk for a peeled boiled potato is pretty much zero. I don’t think it’s accurate to say potatoes are known for botulism; they’re a lot less likely to poison you than a whole range of canned goods. Yeast is a bacteria. Mold is a fungus. That said, I am fairly confident that you can store yeast in the freezer. How do they dry yeast? I have stored dry yeast in the freezer for years. I don’t know what temperature kills yeast? I know they like it warm. Is a food dehydrator to hot for yeast? Yeast is not a bacteria. It’s a fungal spore. I’m a nurse and yeast infections are treated differently from bacterial infections. They are not the same organism. I stand corrected, 40 years since zoology and haven’t given it a thought. I guess I was thinking of the single celled nature of the beast. I probably should have kept my mouth closed instead of airing my inadequacies. Sincerely, couch potato. frozen yeast will not yield the same result as fresh yeast. Most bakers who freeze dough will increase the amount of yeast by about 1/3 so as to make up for the die off of yeast in the freezer. As for a food dehydrator, dried yeast is usually activated at 105-115 F. Anything warmer than this would kill the yeast. The Japanese call yeast “koji”. It is essential in the making of sake which is the Japanese national drink. The sake brewer uses the same wooden building to make the sake that has been used for hundreds of years. The yeast is in the wood and the atmosphere of the sake brewing house. They don’t add yeast to the rice while it is brewing, they use the natural yeast that exists in the wooden structure where the sake is brewed. Because each brewery has its own yeast culture, each brewery’s sake has a distinctive taste. The western tongue most times can’t distinguish between different sake breweries if the difference is subtle, but the Japanese aficionado can easily distinguish between breweries. The Japanese sake brewing trade exists solely because of the natural yeast in the air. The worst disaster they can imagine is for their particular strain of yeast to die off. Of course, the huge bulk sake breweries use a different method of introducing yeast into their product and don’t rely on air-borne yeast at all. They make a uniform bulk brand of sake that is distinct from the small local “kura” or local Japanese sake brewery. I made yeast years ago to make home made bread, and it was wonderful! I didn’t look after it like I should have, though, and it perished. I look forward to retirement when I’ll hopefully have time to start over!! Have used grapes myself for wild yeast. wild and wine are known for their “bloom.” San Francisco Sour Dough can not be replicated else where. The yeast will mutate with changes in the air, humidity etc. For 1500 years my European peasant ancestors lived on barley bread, lentils,spoiled bacon and thick warm beer.I love a good rich dark bread! but have not eaten carbohydrates in many years. Still, passing a cafe or bakery when they’re baking bread I always have to stop and inhale that rich yeasty aroma as deep into me as I can. I learned to bake in an old fashioned scratch bakery a couple generations ago, here’s a recipe for a favorite bread I used to make for winter holidays, not a baking tutorial, just ingredients: stone ground whole wheat flour, unbleached white flour, I like a 50-50 mix but go as dark or lite as you like. Always preferred the live yeast cakes to dried yeast, but live yeast is hard to find these days. Mix 1/2 cup honey, 1/4 cup molasses, 1/2 cup unsalted sunflower seeds, 1/4 cup sesame seed, couple teaspoons of salt. 6 cups of water, another cup of water to make a sponge and let the yeast develop. Mix it all up, start adding flour and kneading, that whole wheat flour needs a lot of work, rise, punch it down, divide into 2 rustic loaves, let it rise again, bake. Have a sharp knife handy, when it comes out of the oven cut open a loaf and eat it fresh and hot as possible with gobs of farmhouse butter, it’s like cake! I’m drooling! But that ain’t unusual. hello IvyMike, How did they use the spoiled Bacon? In this day that wouldn’d be a good idea even with high heat cooking due to the many hard to kill bugs that develops in many spoiled food including bacon and other meats both wild and domesticated. Shucks, even vegetables aren’t real safe anymore without a VERY thorough washing. But I am curious, I heard about this before but didn’t hear how it was used. I plan to try your bread recipe soon. Thanks for including in in this comment. I am assuming that instead of spoiled (bacon) you meant rancid?!? The two are not the same. Great article on how to make yeast. So my question is….once you have the yeast solution is the mason jar and it is bubbling away. Are you saying to utilize the potato solution below the bubbles as the yeast, or the bubbled area contains the yeast? In the article, you mentioned using a TBSP of fresh yeast (potato water ?) in the recipe to substitute for the store purchased yeast. Is there a way to dry the yeast so that it can be stored like store bought yeast? Great article. I always wondered where one got yeast when the corner grocery store was no longer in existence. Now, at least I have an idea where to go. First, however, one needs a potato. Are there other ways to develop yeast besides a potato? Unleavened bread is mentioned in the bible, so there must have also been leavened (yeast) bread. What did the really ancients use to make yeast before Columbus discovered the potato? If you mix flour and water into a runny batter and put it in a bowl or jar, then cover the top with a loose-woven cloth to keep insects out, it should pick up airborne yeast inside a day or two. When it starts to bubble, and a layer of froth appears on top, you know that yeast has got in there and started fermenting. From then on just keep it alive by feeding it flour and water every day, like Connie describes a few comments down. Depending if lactobacteria get into the mix along with the yeast you might end up with sourdough starter, but that’s no bad thing. I make hot pepper yeast. Both foam and liquid contain yeast, foam is mainly air with yeast and reverse for liquid. Both are usable. Thank you so much! That was my question. And approximately 2 TBSP of the liquid would be equivalent to 1 TBSP of the dry store yeast? Guess more would be better than not enough. What you really want to do is have a happy yeast with lots of food to feed it (I.e. Sugar!). Hence looking for the bubbles which indicates a growing culture. Ok, I’ll bite. What is hot pepper yeast? How is it made and used? with the remainder added 2 Tbs Flour 2 Tbs Sugar 1 Tbs Salt warm water to fill (NOT HOT) let sit for a day and use 3 quarters to make bread. the yeast or discard 3 quarters if not making bread. Will last for ever if kept alive by feeding yeast each day.